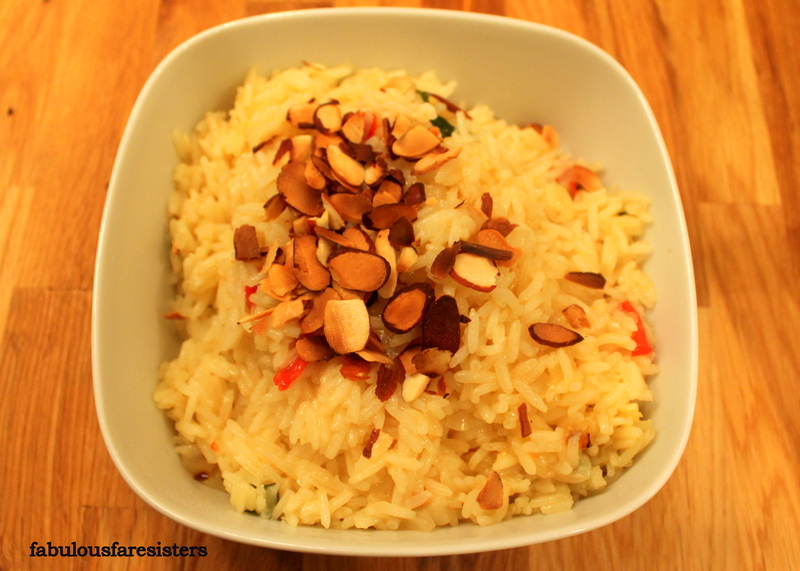 I love creating new rices…so the other day when I made the Chicken Romesco I had a lot of toasted almonds…I decided to make an Almond Rice to accompany the chicken. It was so simple yet again, so tasty! Hope you like it too…Enjoy! In a medium sauce pot, heat the oil on medium. Add the onion and garlic and saute for 5 minutes. Add the rice, parsley and diced roasted red pepper. Sauté another minute. Pour in the almond extract; stir. Add the chicken stock. Bring up to a boil; put the lid on, reduce the heat to low and simmer 12-15 minutes until rice is tender. Place in a serving bowl and top with the toasted almonds. Love this issei. Thank you. Thank you for sharing this! I’m really interesting in trying it. This looks like a delicious dish. The addition of almonds makes it fancy! I also love the idea of the crunch you would get. my dinner offering continue to expand. Thanks so much! I can’t wait to try this one. Linda this looks great! I love almonds but I haven’t tried them in rice. I’ll have to give this one a try!